Here are some of the children’s books and characters that have already been commemorated on U.S. postage stamps. A stamp issued for the 100th anniversary of Dr. Seuss’s birth showed him (in a 1987 photo) with characters from four of his books (l. to r.): the Cat in the Hat (1957), the Grinch from How the Grinch Stole Christmas! (1957), the Glotz (or perhaps a Klotz) from Oh Say Can You Say? (1979), and the Skritz, the anonymous “young fellow,” and the Skrink from I Had Trouble Getting to Solla Sollew (1965). The stamp pane border showed fish from One Fish Two Fish Red Fish Blue Fish (1960). 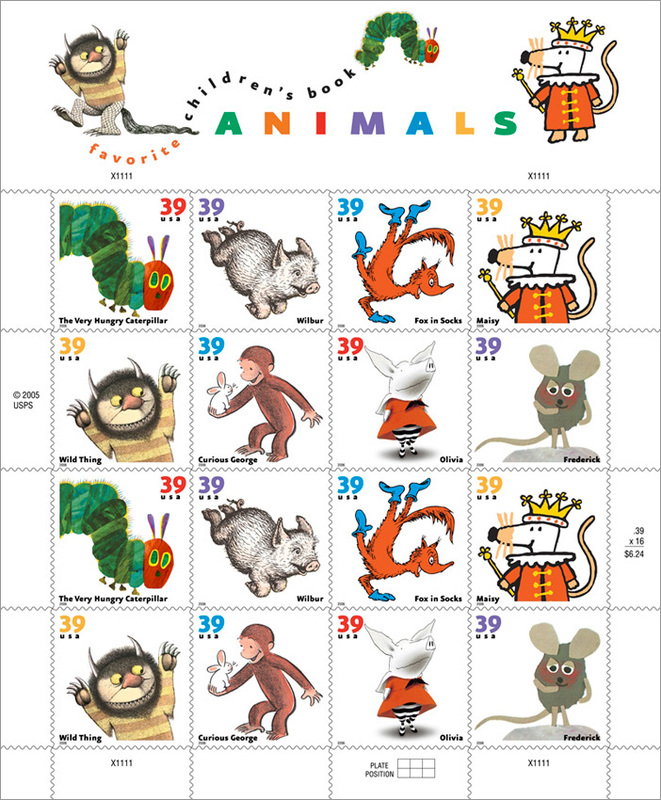 Not all stamps feature literary characters, of course. To learn about the new stamp depicting tennis legend Althea Gibson, which the U.S. Postal Service commissioned from children’s book illustrator Kadir Nelson, click here.